A Promotion Option was entered into in 1989 on 50 acres on the edge of Bedford. ORS won an appeal for B2/B8 warehousing and industrial use in 1991. ORS asked the owners to be patient because we felt over the next few years a change of use to residential could be negotiated through the planning system. This duly occurred with Borough, County and Parish Council support. Consent was finally granted after a successfully fought Call-In Inquiry held in 1996. ORS advised the owners not to sell in 1991 because greater value was foreseen in a residential consent. The Planning Approval entails significant planning gain, namely contributions towards construction of a village hall, social housing and extensive landscaping. An Iron Age settlement was uncovered during the archaeological investigations we commissioned during the planning process. 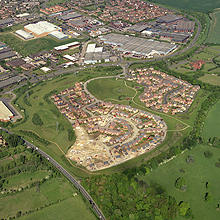 The site was sold to Persimmon Homes in autumn 1996 through the owner's agents Warmingtons - Chartered Surveyors. The last house is scheduled to be completed in 2004 - 15 years after the option was entered into.